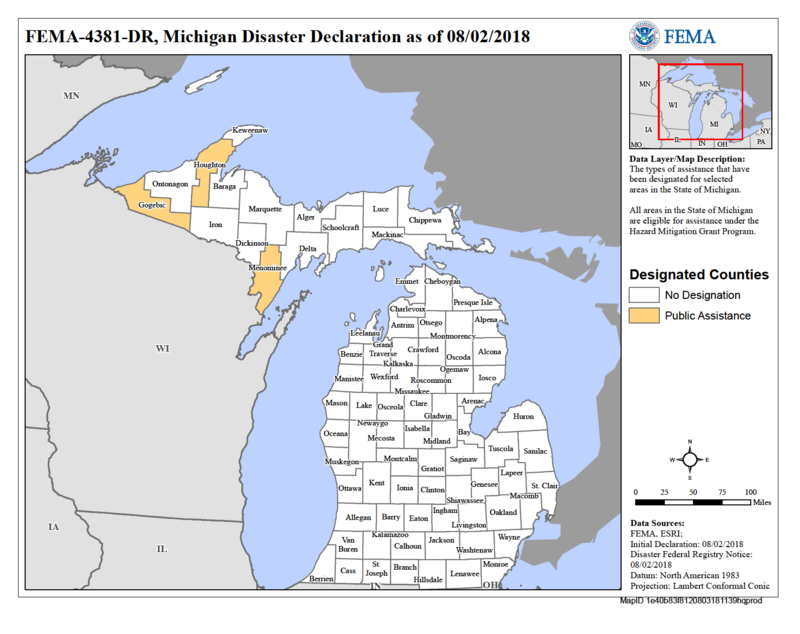 On August 2, 2018, a Major Disaster Declaration was issued for Gogebic, Houghton, and Menominee counties, triggering the release of Federal funds to help communities recover from the severe storms, flooding, landslides, and mudslides that occurred June 16-18, 2018. Eligible applicants include state governments, local governments and any other political subdivision of the state, Native American tribes and Alaska Native Villages. Certain private non-profit (PNP) organizations may also receive assistance. Eligible PNPs include educational, utility, emergency, medical, temporary or permanent custodial care facilities (including those for the aged and disabled), irrigation, museums, zoos, community centers, libraries, homeless shelters, senior citizen centers, rehabilitation, shelter workshops and health and safety services and other PNP facilities that provide essential services of a governmental nature to the general public. PNPs that provide "critical services" (power, water - including water provided by an irrigation organization or facility, sewer, wastewater treatment, communications and emergency medical care) may apply directly to FEMA for a disaster grant. All other PNPs must first apply to the Small Business Administration (SBA) for a disaster loan. If the PNP is declined for a SBA loan or the loan does not cover all eligible damages, the applicant may reapply for FEMA assistance.